How to Face an Interview for Lecturer Post? To be a good lecturer you need to have a number of positive attributes. A lecturer is primarily expected to be a good teacher above everything else, who will be able to arrest the attention of the students and encourage them to learn new things and gain more knowledge. A good lecturer is able to inspire all his students with his words and allows them to think freely and ask questions. 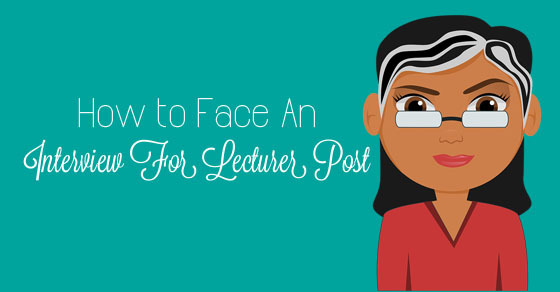 If you are a lecturer and are terrified about appearing for an interview, then here are some tips that will help you to face an interview for lecturer post. How to Prepare for College Lecturer Interview? Preparation for an interview is important, no matter which job role you are applying for. Most of the people even though qualified and eligible are not able to get the job, as they do not perform well in interviews. The main reason for it is the nervousness that binds them up during the interview. Being nervous and having a little tension while attending the interview is very common, but with proper preparation, you can avoid all such issues. An employer would expect the person for the post of lecturer to be well spoken, poised and engaging. Being genuine and honest with a little preparation about the organization will help you crack the lecturer interview easily. Mentioned below are few tips that help you crack the lecturer interview. When you appear for an interview for a lecturer post, you must ensure that all your positive attributes come shining forth so that they are able to choose only you from all the other candidates which have given in their application or have appeared for the interview. It is vital that above everything else you show that you are someone who is a people’s person and that you are very approachable. If you have this kind of a positive quality then the interviewer will surely want to recruit someone like you, as colleges like to have lecturers that are student friendly. To prosper in almost every line, nowadays people require top-notch communication skills. A lecturer especially has to have brilliant communication skills as if he or she does not speak in a proper manner then the students are never going to understand what is being said to them. No school or university will want to employ a lecturer who is not fluent in speaking and cannot express himself or herself well. Before you face your interview, ensure you brush up on your communication skills and also during the interview, speak clearly and comprehensively, without stammering or stuttering as this is going to reflect badly on you. When you are going for an interview, ensure that you are well prepared and have carefully thought of the things you are going to say from beforehand. It is imperative that when you appear for the interview, you mention in detail the topics and chapters which you would like to cover and why you think that you would be able to do justice to the topics. You must mention the experience which you gained over the years and also all the qualifications which you have. You should ensure that the topics you choose are important and also pertaining to the job which you are applying for. A lecturer is someone who has to have a commanding presence or chances are that no one in the class will listen to him. The best way on how to face an interview for a lecturer post is to show in your manner that you are someone who is a no-nonsense person and is perfectly capable of maintaining discipline in the classroom. This having been stated, ensure that you maintain a proper and very dignified body language in the course of the interview, so that you are able to impress the interviewer with your stance, decorum and mannerisms. One of the worst things which you can do when facing an interview for a lecturers post is to show that you are someone who has no confidence and that you easily falter when some tough challenge is thrown your way. In the course of your interview, you must show that you are someone who has a great deal of confidence. If you fail to believe in yourself then no one is going to place their trust in you and give you the post at their reputed school or institution. Do ensure that you do your best as if not, there will be plenty of others who can easily take your place and grab the opportunity with both arms. Simply having good communication skills is not good enough when you are facing an interview for a lecturers post. You must ensure that you can not only talk the talk but also walk the walk. So prior to appearing for the interview, ensure that you have brushed up on your theoretical knowledge and that you are capable of delivering lectures in a proficient manner. You must ensure that you come for the interview, well prepared and that you learn up things which are relevant to your field of expertise. An interview might suddenly throw some theoretical questions your way, during the interview. A lecturer is someone who is expected to be rather versatile. When you are going to face an interview for a lecturers post you must ensure that you let this versatility shine forth so that you let the interviewer know, that once you are employed you will be able to help the students in a number of ways and inspire them to become keen learners, thinkers and intellectuals. In the course of your interview, make it a point to mention the methods which you will use to lecture. State whether or not, you will make use of the blackboard, show illustrations or models etc to bring the topics to life. There is nothing that will help you bag the job faster than if you say that you are someone who has been honoured in a big way by receiving some award or the other. Nowadays there are a number of ways in which, one can attain a degree, either through online courses or even correspondence courses. Yet not everyone is able to bag prestigious awards. So do not forget to mention this fact about yourself, if you are one of the lucky people that have been felicitated by one institution or another. State this and you are sure to bag the job with great ease. A good lecturer is one who teaches well and also have good methods of assessing whether or not the students have been able to grasp anything which has been taught. So when you are to face an interview for a lecturers post, ensure that you mention the methods which you would like to adopt in order to test the students. State that you have your own unique methods of testing the students in addition to applying the conventional methods of testing as well. Doing something like this will show the examiner that you are someone who has your own unique manner of doing things. When facing an interview for a lecturers post ensure that you state in no uncertain terms that you are someone who is very up to date with modern developments in the field and that you ensure that you constantly keep studying so that at no point in time is the knowledge which you are delivering, outdated or not up to the mark. Just because you have your degrees, it certainly does not mean that you should stop studying. A good teacher is also an intellectual who is primarily also interested in broadening his own horizons. We presently live in an age where technology has become an indispensable part of our lives. Most of us cannot even function properly without our mobile phones and laptops. If we have a question, we simply type our query into our smartphones and get an immediate answer. When appearing for an interview, ensure that you state that you are someone who is very well equipped in making use of modern technology and you will be making use of gadgets like a projector, laptop, whiteboard etc in order to arrest the attention of your students who will be attending the class. As mentioned above, when facing an interview you must ensure that you come prepared. If you appear unprepared for the interview, then automatically you will not be confident about what you are saying. You must ensure that you do a thorough background study of the school or institution before coming for the interview so that you are able to answer in a very specific manner. If your answers are rather general and vague then chances are that you will not get the job. Show how your skills and services are something which the school would tremendously benefit from. An interview is someone who not merely speaks well but speaks a great deal of sense. If you are applying for the post of a lecturer then you must naturally show that you are a capable individual who thinks carefully before giving an answer to a question. If you answer in a callous and a loud manner then bagging the job will be impossible for you. No one wants to hire a lecturer who blurts out things from the top of his hat and goes on to regret them later. State that you know how much your words are going to influence your students and that is why you are accustomed to thinking carefully before saying anything. Chances are that when facing an interview for a lecturer post, you are going to be rather nervous, yet ensure that you do not let your nervousness affect your thoughts. Rather let your nervous being out the best in you so that you are able to blow the socks off the recruiter. If you must, take some minutes to answer your questions, so that you are able to set a very good impression in the mind of those who are taking your interview. To be a lecturer you must primarily be a good educator. A good lecturer is not someone who loves money; rather he is someone who loves imparting wisdom to young eager learners. So when you are facing an interview for a lecturer post you must ensure that you let this love and passion for teaching shine through your words so that the interviewer feels that someone like you will truly be invaluable at their educational institution. If you are truly passionate about what you do, it will come forth without any effort on your part. Lecturers who are very interesting and have a curious bend of mind are termed best. When facing an interview for the post of a lecturer then ensure that you mention this quality about yourself and also speak in a lively and interesting manner so that the person recruiting you will be convinced that hiring you in the institution will be a very smart move indeed. What is the process you use to organize the presentations? What would be your approach if your students don’t look to get engaged? Will you be using question-and-answer format for teaching? Explain any situation when your students contradicted or challenged your lecture and how di yo handle it? Being a lecturer is not an easy job and only those people who have exceptional communication, analytical and comprehension skills are able to make it big in this line. A lot of us can learn a number of things but it takes a good lecturer to be able to make someone else understand a particular theory or law. Facing an interview is something which all of us greatly fear. Even people who have a lot of experience feel butterflies in their stomach while sitting before the person who is going to recruit him. You must ensure that you do not let this nervousness get to you and you make the most of the job opportunity which has come in the form of this interview.